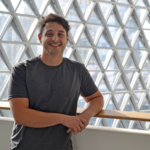 Matthew Iasiello is a research assistant and PhD candidate at the South Australian Health and Medical Research Institute (SAHMRI) Wellbeing and Resilience Centre. Matthew’s research interests include translational mental health interventions and mental health care reform. Around the world, governments are reforming the way they address mental health care in response to the rising burden of mental illness. Mental illness represents a complex issue underpinned by individual, interpersonal, societal, and environmental factors made more complicated still by philosophical and political differences regarding where responsibility to solve the issues lie. To illustrate this complexity, stakeholders may include clinicians, practitioners, policy-makers, advocacy groups, funders, governments, lived experience groups, and end users, all of whom may have conflicting priorities and agendas. 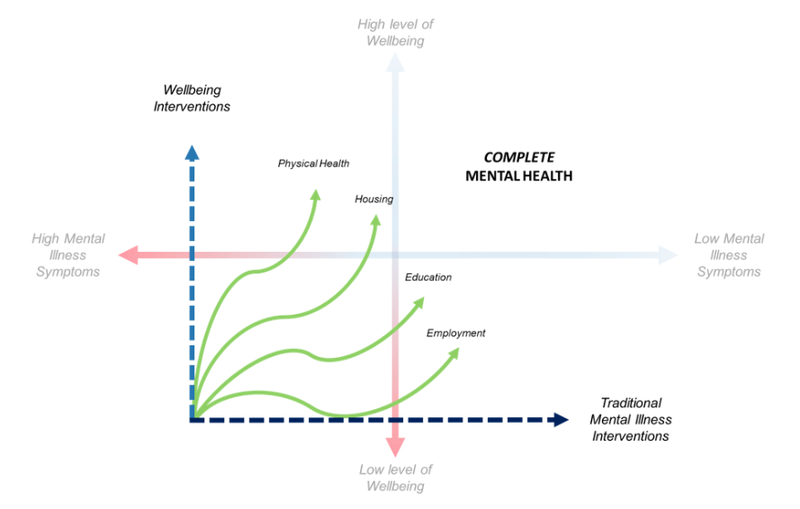 As a result of these differences, efforts to prevent, reduce, treat, and recover from mental illness often become siloed and fragmented.The South Australian government declared its vision to become the ‘State of Wellbeing,’ inspired by Martin Seligman’s recommendation that the state could become the first political entity to take a state-wide approach to measure and build the wellbeing of all its citizens (Seligman, 2013). The Wellbeing and Resilience Centre was established at the South Australian Health and Medical Research Institute (SAHMRI) to progress the state government’s ambition, particularly through the delivery of large-scale resilience interventions. A significant challenge for the Centre has been demonstrating to public and private organisations where and how preventative mental health interventions, such as resilience skills training, fit within the complex mental illness landscape. To overcome this challenge, the Centre has found a useful tool in Keyes’ (2005) dual-continua model of mental health. Keyes’ (2005) landmark publication revealed that mental illness and positive mental health (or wellbeing) are two separate, correlated, unipolar dimensions. In other words, mental illness and mental health are two separate but related concepts and are not two opposite ends of the same spectrum, as was previously thought (Figure 1). Since this publication, a modest amount of research has been published to support and better understand this phenomenon. In particular, some have replicated the original study (Westerhof & Keyes, 2010), described its potential application in fields such as recovery (Slade, 2010) and trauma-informed positive education (Brunzell, Stokes, & Waters, 2016), and investigated mediators of mental health and mental illness (Venning, Kettler, Zajac, Wilson, & Eliott, 2011). To the best of our knowledge, only one publication has investigated this phenomenon longitudinally in response to an intervention (Trompetter, Lamers, Westerhof, Fledderus, & Bohlmeijer, 2017). Figure 1. Representation of the complete state model of mental health, adapted from Slade (2010). Confusingly, this phenomenon has been described using multiple names including the dual-factor model of mental health (Suldo & Shaffer, 2008), two-continua model of mental health (Westerhof & Keyes, 2010), and complete-state model of mental health (Keyes, 2005). For simplicity, the name complete state model (CSM) of mental health will be used, which describes ‘complete mental health’ as a state in which an individual has both a high level of wellbeing and a low level of mental illness symptoms (or is without a diagnosis of mental illness; Figure 1). Mental illness refers to mainly depression, anxiety, and mood disorders (following Keyes’ original evidence), but does not discount that this model could include psychoses and other severe mental illnesses. The author suggests that the finding that wellbeing and mental illness are separate, but related, phenomena presents incredible implications that could revolutionise how individuals and societies structure mental health care. An attempt to describe these implications is described here, and feedback is welcomed from the International Positive Psychology Association network. 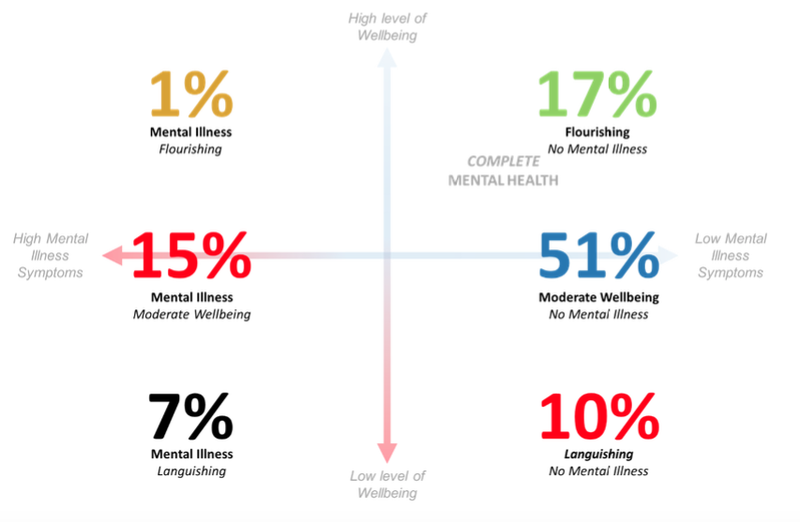 Consider measuring an entire population using a tool for both wellbeing and mental illness, and subsequently ‘plotting’ the individuals on the CSM map (Figure 1). The author suggests that individuals experience a range of ‘forces’ that would influence their position on the map, displayed in Figure 2. The term forces is used to describe individual, interpersonal, social, and environmental factors that individuals experience that may moderate their mental illness and wellbeing. For example, individuals may experience the ‘actual’ force of their physical health or the social determinants of health that may predict or contribute to their position on the map. These ‘actual’ forces are represented by green arrows in Figure 2, and may include a myriad of factors such as physical health, housing security, education level, quality of employment, exposure to nature, air quality, discrimination, oppression, etc. Figure 2. Representation of the ‘forces’ that act upon individuals within the complete state model of mental health. Additionally, individuals may also experience the ‘potential’ forces of interventions, which are generally designed to either reduce mental illness symptoms or improve the ‘symptoms’ of wellbeing. For example, ‘traditional mental illness interventions’ may include services currently included in mental health care systems such as psychological, psychiatric, or counselling services, or online resources such as beyondblue.org.au and lifeline.org.au in Australia. Wellbeing interventions may include activities with an emerging evidence-base that may not yet be included within mental health care systems, such as mindfulness courses, gratitude practices, or resilience skills training. Of course, it is to be anticipated that many interventions will serve to both reduce mental illness symptoms and improve wellbeing (see Bolier et al., 2013). This simplistic analogy begins to unravel the complexity of the mental health landscape and draws attention to the vital importance of collaboration between the multiple stakeholders involved. Importantly, CSM highlights that efforts to reduce mental illness, improve wellbeing, and improve physical health and the social determinants of health are complementary and fundamental to improving the mental health of a population. Therefore, the first implication of CSM on mental health care is its ability to remove barriers between fragmented stakeholders of mental health and re-align them as fundamental partners towards creating complete mental health. The second implication is the ability for mental health stakeholders to clearly demarcate and define the line between prevention and treatment. Keyes (2007) began the process of defining sub-populations within the CSM map, by identifying six subgroups and their proportions in the United States, visualised in Figure 3. Figure 3. Classifications and prevalence of sub-populations within the complete state model of mental health, adapted from Keyes (2007). Although the ability to create subgroups was limited in Keyes’ (2007) work (because of the use of categorical variables for wellbeing and mental illness), future research should replicate these findings to identify more accurate representations of the subgroups within a population. The author suggests that individuals within each subgroup may require, respond to, and benefit from vastly different intervention approaches. Currently it is relatively unknown which individuals will respond best to interventions to improve their mental health, and the author advocates that all future mental health interventions and services measure both wellbeing and mental illness that can be tracked at the individual level. It is exciting to consider that accurate classification of these subgroups and ‘tracking’ of individual progress could dramatically improve the person-to-intervention fit. This could result in improved treatment quality as individuals presenting anywhere on the CSM grid could be ‘triaged’ into the most appropriate intervention, whether it be prevention or treatment focused. For example, future research using this approach could empirically examine whether someone that is languishing and with mental illness may benefit best from some combined or staged therapy of psychiatric and psychological care followed by wellbeing interventions, whereas someone with moderate wellbeing and no mental illness will benefit best from preventative wellbeing strategies alone. A precedence for this collaborative approach has been set (Fava, Rafanelli, Cazzaro, Conti, & Grandi, 1998; Rashid, 2008; Slade, Oades, & Jarden, 2017). This implication aligns closely to Australian mental health care reform, as this new knowledge could inform and advance the stepped-care approach, which describes the provision of a suite of services available to individuals at every ‘step’ of severity of need (Australian Government Department of Health, 2017). Again, this has been over simplified to illustrate the point, and it is expected that a range of factors would also inform a person-to-intervention fit, such as personality, motivation, and personal preference. Additionally, the identification of these previously ‘invisible’ subgroups may be useful for policy-makers and governments to specifically allocate resources, establish health priorities, and set public policy. The final implication is related to the role of the CSM as a de-stigmatising narrative and its potential use to ‘track’ an individual’s ongoing journey either recovering from mental illness or building their mental health. The author suggests that CSM is conceptually appropriate for a layperson, who potentially could use their location on the grid as a source of optimism or resilience in their mental health journey. 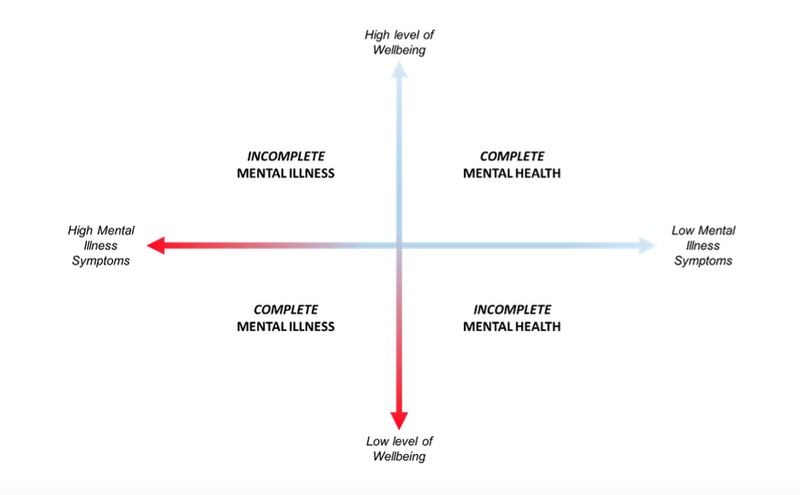 For example, rather than endure the stigma of suffering from a mental illness, an individual in the bottom left quadrant of Figure 1 could find hope in the notion that they could build their level of wellbeing (being relatively more transient than mental illness), and therefore improve their position on the CSM grid. To illustrate, it is suggested that this change in focus may be analogous to an individual diagnosed with Type II diabetes who focuses their (and their support network’s) attention to improving their diet and cardiovascular health in addition to treating the manifestations of their illness. A significant body of research must be performed to realise the potential of the implications presented in this paper. These implications inspire a range of novel and important research questions, and interested collaborators or critics are invited to contact matthew.iasiello@sahmri.com. The diagnosis of a mental illness should not prohibit an individual from endeavouring to improve their level of wellbeing (with necessary support in place). The CSM identifies unique and necessary roles for traditional mental illness services, wellbeing interventions, and public health services in improving the mental health of populations, which may facilitate greater collaboration and co-operation between these stakeholder groups. Previously ‘invisible’ sub-groups can be identified through the CSM, which could improve decision-making for distribution of resource and establishing health priorities and public policies. These sub-populations may require, respond to, and benefit from vastly different interventions, and the CSM may provide a useful framework to better understand these interactions by improving the person-to-intervention fit. The CSM could be used by individuals (and their clinicians) to ‘track’ their journey either recovering from mental illness or building their mental health. Fava, G. A., Rafanelli, C., Cazzaro, M., Conti, S., & Grandi, S. (1998). Well-being therapy. A novel psychotherapeutic approach for residual symptoms of affective disorders. Psychological Medicine, 28(2), 475-480. Rashid, T. (2008). Positive psychotherapy. In S. J. Lopez (Ed. ), Positive psychology: Exploring the best in people (pp. 187-217). Westport, CT: Praeger. Seligman, M. (2013). Building the state of wellbeing: A strategy for South Australia. Adelaide: Government of South Australia. Slade, M., Oades, L., & Jarden, A. (2017). Wellbeing, recovery and mental health. Cambridge, UK: Cambridge University Press. Suldo, S. M., & Shaffer, E. J. (2008). Looking beyond psychopathology: The dual-factor model of mental health in youth. School Psychology Review, 37(1), 52.